Serves 4. Preparation time 15 minutes. Cooking time 2 minutes. A soft bread roll, creamy sweet chilli sauce and crispy calamari... Come on, summer! • Rinse the calamari and pat the rings dry with kitchen paper. • Mix the cornflour with the rest of the Cajun spice ingredients and transfer to a plastic bag. Add the calamari to the bag and shake. • Put all the ingredients for the pink sauce in a food processor and pulse. Dilute with some boiling water if the sauce is too thick. • Heat a few tablespoons of butter and sunflower oil in a big pan until hot, but not smoking. Remove the calamari from the plastic bag and shake off the excess flour. Put the rings in the pan, shake and turn them over. The calamari will be cooked quickly, within 1 -2 minutes. Don't fry the rings for too long or they'll become chewy. 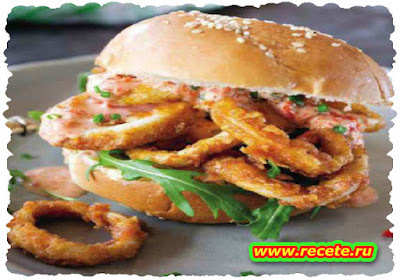 • Serve on a soft roll with a scoop of pink sauce and some rocket leaves.